Fiscal Sanity: Which political party is better at managing taxpayer dollars? The latest ranking of states' fiscal condition offers an unequivocal answer. For several years, the Mercatus Center at George Mason University has ranked states based on five measures of their financial condition: cash solvency, budget solvency, the ability to meet long-term spending commitments, state spending and taxes as a share of personal income, and unfunded pension liabilities and debt. And lest anything think that Mercatus  a free-market-oriented group  is fudging the numbers, note that the data used to compile these rankings all come from official state annual financial reports and from state actuarial reports. For 2016, the latest year for which data are available, the top five most fiscally sound states were, in order: Nebraska, South Dakota, Tennessee, Florida and Oklahoma. 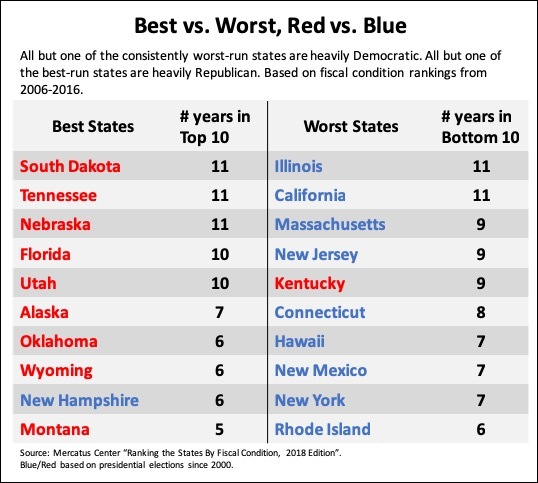 The five worst states, starting at the bottom: Illinois, Connecticut, New Jersey, Massachusetts and Kentucky. Those are the top five and bottom five. You do the bottom 15 and you are not going to feel so glowing. Don’t forget, fiscal irresponsibility, weakness on crime and weak immigration policies (sanctuary) go together. Ill be thinking of this walking through Downtown LA , through the hordes of typhus infected homeless people, on my next business trip there. Someone tell that buffoon mayor Eric Garcetti to worry more about his messed up city, and to give up his delusional dream of running for president! I like to use the word "sustainable" when I talk to my liberal friends, I point out that debt and obligations are like pollution being handed down to the not only the next generation, but several generations. I like to compare debt to the environment and point out it's like what the Soviets did to the Aral Sea, it's generational and devastates the landscape. The badly run states are not sustainable and in this case, the kids really are going to pay the price. This has been done for more than 40 years plus you will notice that is why New York and California get what they want and are nothing short of the Mafia. Sop illegals fro voting and you do away with the largest part of their power. New York and California are slavery states and the poor folks their that are used come from the poorest places in the world and are easily bought. Oklahoma? Run by republicans. Big mess.